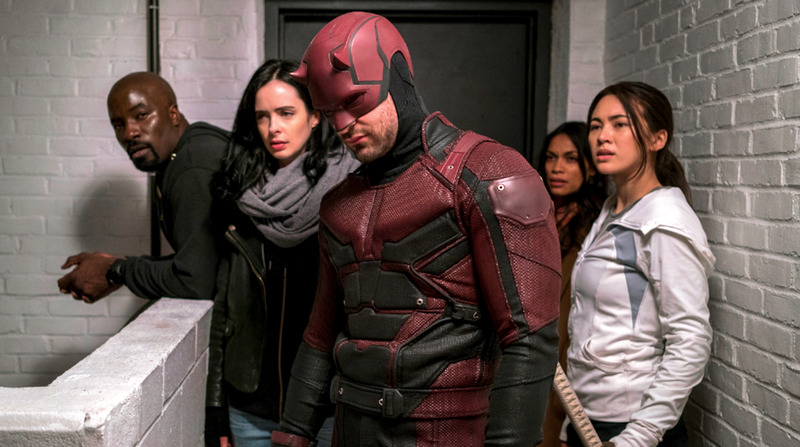 Data from Crimson Hexagon provided to Business Insider shows that social-media buzz for Netflix’s Marvel shows has dropped dramatically over time. Netflix abruptly canceled “Luke Cage” and “Iron Fist” this month, and the data suggests that “Daredevil” and “Jessica Jones” could also be in trouble. Posts on Twitter and Instagram decreased significantly after each shows’ first seasons. Fans of Netflix’s Marvel shows were left disappointed and puzzled when the streaming giant abruptly canceled “Iron Fist” and then “Luke Cage” this month. Data provided to Business Insider by consumer-insights company Crimson Hexagon shows that social-media buzz for all four shows has dropped dramatically over time. Since Netflix doesn’t release viewership numbers, social-media data is one of the best alternatives to finding out whether these shows have legs to stand on. 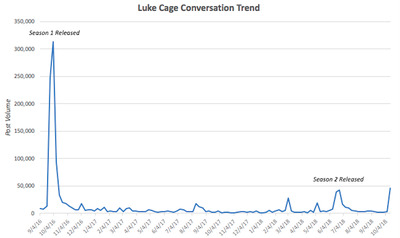 The chart below shows that when the first season of “Luke Cage” premiered in September 2016, there were over 300,000 Twitter and Instagram posts regarding it. That number took a huge dive when the second season was released this June, with less than 50,000 posts. 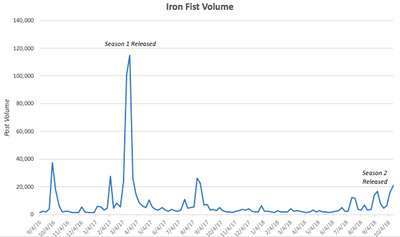 The same can be said for “Iron Fist.” The critically panned series improved slightly in its second season, but social-media reaction was still sparse compared to its first season. When the first season debuted last year, it inspired almost 120,000 posts on Twitter and Instagram. 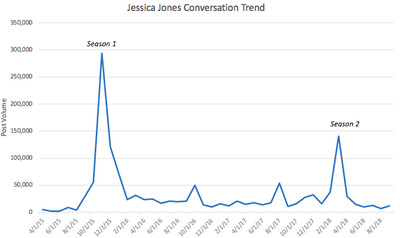 The second season peaked at less than 20,000. 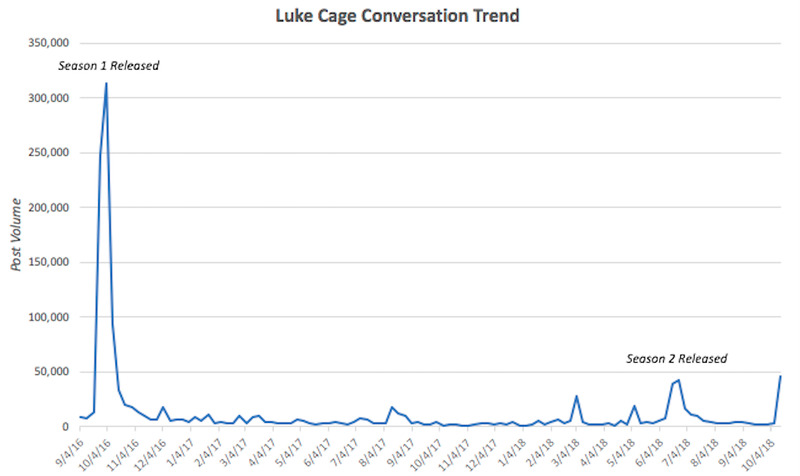 The good news for “Daredevil” and “Jessica Jones” is that the results aren’t as dramatic as for “Luke Cage” and “Iron Fist.” The bad news is that there is a noticeable pattern in that interest has wavered after the shows’ first seasons. 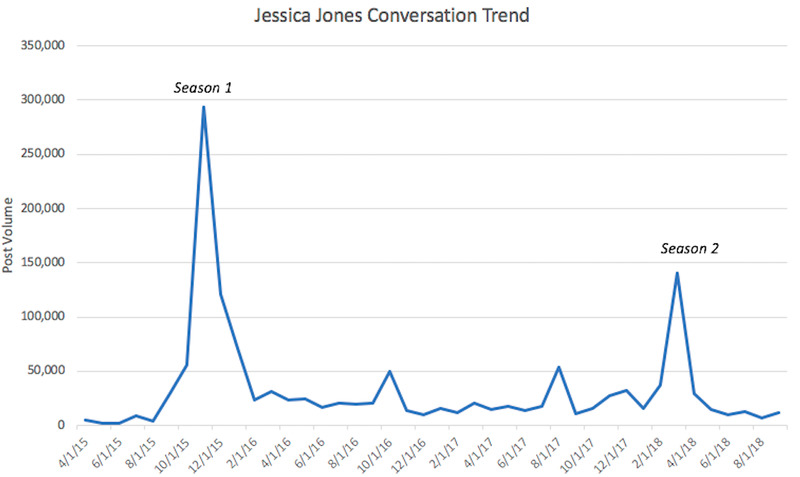 There were nearly 300,000 posts on Twitter and Instagram for the first season of “Jessica Jones.” That was cut in half when the second season was released this year. 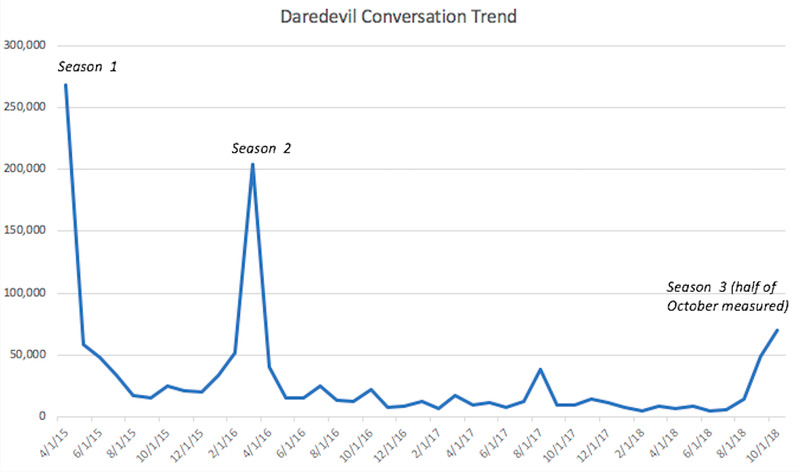 “Daredevil,” the longest-running Netflix Marvel show so far at three seasons, has seen a drop in social-media buzz over time, but less so than the other shows. The first season in 2015 saw nearly 275,000 posts, while season two saw a little over 200,000. That’s not a huge drop, and the recently released third season inspired around 75,000 posts halfway through October, meaning that number could increase by month’s end. 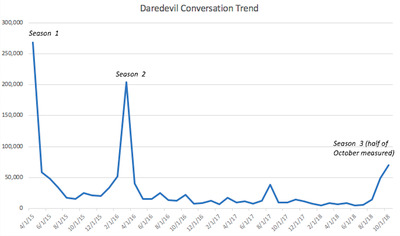 If any of the shows was safe, it would probably be “Daredevil” based on this data, but the pattern still holds. 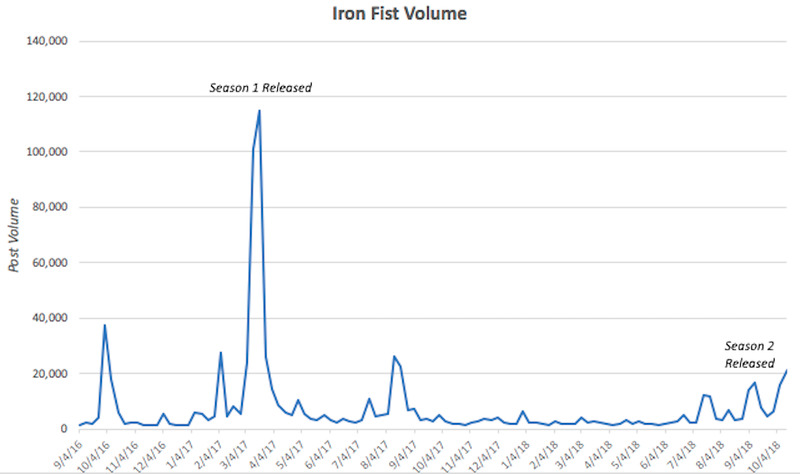 Crimson Hexagon also found that sentiment for the four shows has been mostly positive, the highest being for “Daredevil” at 79% and the lowest being for “Iron Fist” at 53%. But it’s apparent that buzz around the shows has decreased. The Hollywood Reporter reported that “Luke Cage” was canceled due to creative differences. And as Disney, which owns Marvel, prepares to enter the streaming war with its own Netflix competitor next year,it could be changing its strategy in regards to Netflix’s Marvel series. Disney is set to terminate a contract with Netflix at the end of the year, and while it has said that it has no plans to move the shows from Netflix, the competitive landscape of the streaming business could force its hand. But this data also suggests that audiences just haven’t been as interested in the shows as Netflix may have liked, and later seasons didn’t generate the excitement of their first seasons.